Prompt FTP Client is a File Transfer Protocol (FTP) client that is used to transfer files between your computer and File Transfer Protocol (FTP) servers. Whether you are publishing a Web page, downloading the latest digital images, music, or software, or if you are just transferring large files between your home and office, Prompt FTP Client gets the job done every time. 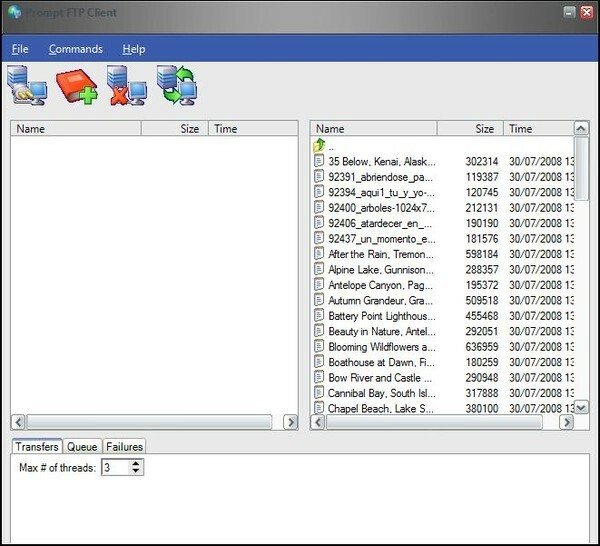 Prompt FTP Client assures efficient, reliable, secure connections. ...... server over FTP, the standard for moving files across the Internet. Prompt FTP Client assures efficient, reliable, secure connections and transfers over FTP. * Standard FTP - Compatible with any industry standard FTP server. * Step-by-step Connection Wizard - Easily setup your first FTP connection. * Integrated Editor - Perform quick edits of remote Web pages or other documents using a powerful integrated text editor. An easy to use explorer-like FTP program with state of the art drag and drop. Fast and secure file transfers for all levels of users! Qweas is providing links to Prompt FTP Client 1.5 as a courtesy, and makes no representations regarding Prompt FTP Client or any other applications or any information related thereto. Any questions, complaints or claims regarding this application Prompt FTP Client 1.5 must be directed to the appropriate software vendor. You may click the publisher link of Prompt FTP Client on the top of this page to get more details about the vendor.